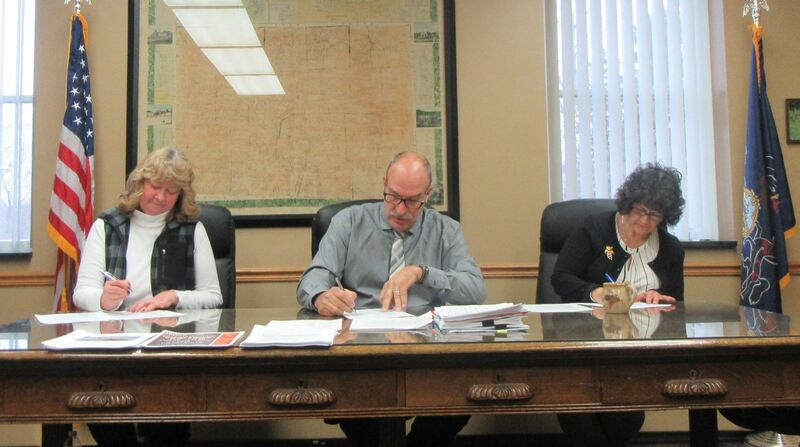 Susquehanna County Commissioners (above, from left) MaryAnne Warren, Alan Hall, and Betsy Arnold met at the courthouse in Montrose (top) on Wednesday morning. Numerous surplus items stored in the maintenance building at back left of the courthouse will be available for sale in March. 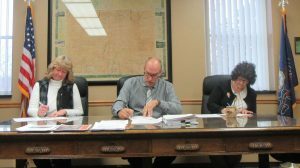 The Susquehanna County Commissioners tackled a typically ambitious agenda at their regularly scheduled meeting on Feb. 22 that included numerous new hires and transfers, the introduction of “Poll Pads” for the primary elections in May, and an opportunity for the public to purchase office equipment and building parts no longer needed by the county. The regular meeting was recessed for a salary board meeting during which the creation of a new part-time judicial position geared at providing more stability for youths was approved. 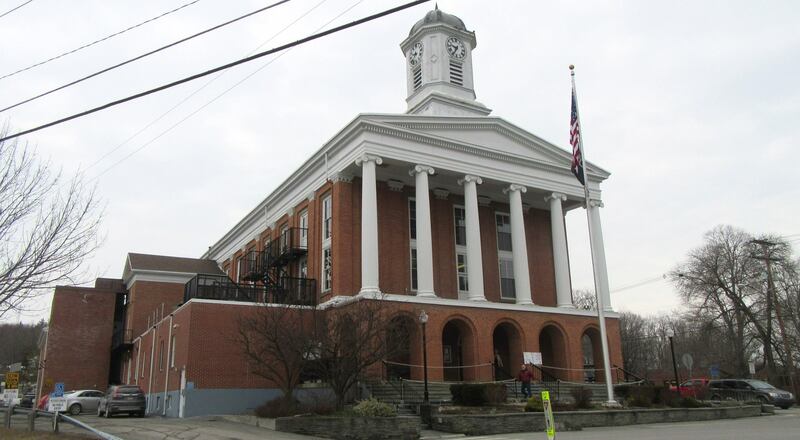 At the recommendation of President Judge Jason Legg, Susquehanna County will seek to hire a Guardian Ad Litem for Dependency Actions at $32,000 per year. In the past, Legg explained, the court would seek any available attorney to represent minors, which resulted in inconsistencies for the children involved and challenges to the court schedule itself. Having a dedicated Guardian Ad Litem, Legg suggested, should ease the burden on the court to appoint a lawyer in a timely fashion and provide better representation for minors. It is hoped that the position can be filled in association with an established law firm, in the event that someone should have to fill in temporarily. Other salary board items related to the court system included the changing of the current job title of Law Clerk to Judicial Law Clerk/Assistant to the District Court Administrator, with no change in salary or benefits, as well as the modification of title and salary of the current Children & Youth Hearing Officer to Dependency Master for Permanency Review Proceedings. Among other business discussed and approved upon returning to the regular meeting, the commissioners unanimously approved the purchase of a software license and professional service agreement between the county and KNOWiNK of St. Louis, MO, for new digital Poll Pads and three years of maintenance support at a cost of $74,405 for 2017 and $5,625 for both 2018 and 2019. The devices are essentially iPads that will be placed in all polling precincts in Susquehanna County this spring to replace the old voter registration books. The purchase was recommended by county Director of Voter Registration SarahRae Sisson after nearby Wayne County reported successfully using the Poll Pads for two years. According to Commissioner Alan Hall, the Poll Pads will reduce wait time for getting into precincts and downloading information when the pads are returned to the courthouse. It will also be easier to determine if somebody is voting in the wrong precinct, Hall noted. If there is not enough time for the voter to reach his or her correct precinct, a provisional ballot can still be cast wherever that voter is. Hall announced that a change order had been received by the commissioners on Tuesday evening concerning the final work to be done on the third floor of the courthouse. At an additional cost $280,000, three new rooms for district attorneys will be added, and Courtroom 2 will be expanded. Act 13 funds will be used to cover the cost of the expansion. On Jan. 11, Hall reported that the final design would maintain the historic integrity of the courtroom while ensuring that it meets code. Before adjourning the meeting, the commissioners unanimously agreed to advertise an extensive list of office- and building-related items via sealed bids in March. The items include some equipment that is no longer needed, as well as parts displaced by the recent renovations at the courthouse, including several windows and light fixtures that will be replaced by LED fixtures. Hall noted that some items, such as desks and filing cabinets, have seen better days, but a surplus sale made more fiscal sense than simply hauling everything to a dump. “Maybe we’ll make some money on it,” he remarked. The items will be available for public inspection from 10 am to 3 pm on Monday, March 6 in and around the maintenance building at the rear of the courthouse. Sealed bids will be opened by the commissioners at their March 8 meeting. A final list of items will be available for viewing at www.susqco.org on Friday, March 3 under the “current bid specifications” tab. County employees are not eligible to bid. 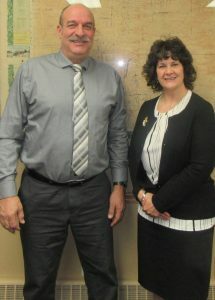 Commissioners Alan Hall (left) and Betsy Arnold.